We asked our son, who looked a little confused after this one, whether it made sense. “NOTHING made sense,” he shouted. 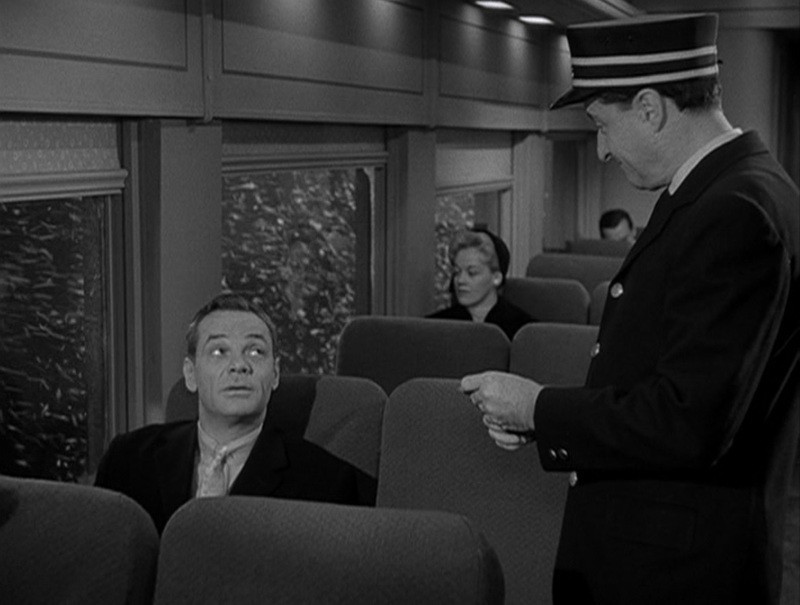 “A Stop at Willoughby” seems to have a reputation as one of the great episodes of The Twilight Zone, but I’m with the kid. I didn’t care for it, either. It’s the bad luck of my picks that this is the third of twelve episodes that I picked that center around a character longing for a fantasy life, and I’m tired of it. Worse, and this certainly isn’t the show’s problem but my own, I’ve had a pretty intense hatred for “the good old days”-fueled nostalgia for quite a long time. The murder rate’s lower than it’s been in decades, people can leave godawful marriages like the one depicted in this episode without scandal, we’re certainly closer to equality than they were in 1960, and I’ve got about seven thousand songs on my phone. I may love sixties and seventies television and fifties clothing, but you can stuff that longing for small town nineteenth century life, grandpa. To put a few things in the plus column, while James Daly has the thankless and impossible task of making me sympathize with his character, he has a pretty good breakdown scene. The great character actor Howard Smith is well-cast as the blustery boss, and it’s nice to see Patricia Donahue, who was hopping back and forth to appear in both American shows and ITC productions like The Saint, Danger Man, and Thriller, even if her role is just plain awful. Another thing I’m sick of in season one of Zone – and again, we’ve only seen twelve of thirty – is deeply unhappy marriages. Maybe Rod Serling was projecting a little, because James Daly’s character is not the first literate, gentle, and thoughtful protagonist we’ve seen to be trapped in a loveless marriage with a woman who is depicted as a one-dimensional beast. Richard Matheson’s “A World of Difference” is guilty of it as well. Mercifully, that horrible marriage has ended, but again, the woman is a nasty and unsympathetic piece of work. It’s a weird, weird blog when I went into sodding Space Academy prepared for the worst only to enjoy it a good bit, and the allegedly classic Twilight Zone is just awful about half the time we watch it.